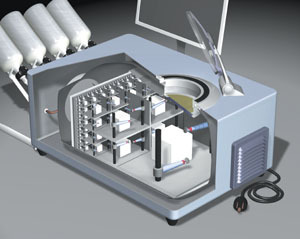 Art and science combine to create a representation of a desktop-scale molecular manufacturing appliance. As envisioned, tiny machines would join molecules then larger and larger parts in a convergent assembly process that makes products such as computers with a billion processors. Nanotechnology could lead to next arms race; experts debate how to prepare. The science of the very small has big military, economic and security implications for the future. From molecular manufacturing to incredibly smart chemical weapons, the raw materials and ultimate paraphernalia that nanotechnology will enable boggle the imagination of even science fiction aficionados. However, experts who scrutinize the science and significance of nanoscale devices differ on how this kind technology will affect future generations as well as on what should be done today to keep the United States out front in this field. Primary issues of concern include who should be keeping an eye on developments in the field. Nanotechnology may or may not turn out to be a disruptive force, but it is, without a doubt, an enabler. As a result, advisers who work with industry and with the government recognize that a balance must be achieved between control and independence so that U.S. security is assured without suppressing the entrepreneurial spirit. Today, the U.S. government and industry have a very broad definition of the term nanotechnology. In general, it refers to materials, products and devices that have features that fall in the 1 to 100 nanometer range. One organization that is a careful observer of this tiny technology is the Foresight Institute, Palo Alto, California. The institute’s mission is to help prepare society for anticipated advanced technologies, particularly molecular nanotechnology. Christine Peterson, vice president of public policy and co-founder of Foresight Institute, says that one way to look at a topic as broad as nanotechnology is to divide it into three time frames: near term, midterm and long term. While there is no consensus about the definition of each of these periods, in general the near term refers to technologies and effects that will occur in the next 5 years; the midterm time frame ranges between 5 and 15 years from today; and the long term is considered more than 15 years from now. In the near term, nanotechnology will result in materials that are lighter and stronger and will feature different properties than materials available today, Peterson states. These improved materials will be important in military applications, she adds. Midterm nanotechnologies will be “a bit more exotic,” Peterson forecasts. Dr. Edwin L. Thomas, director of the Institute for Soldier Nanotechnologies at the Massachusetts Institute of Technology in Cambridge, boldly expresses predictions about potential capabilities in the military realm in this time frame, she relates. While many people are apprehensive about predicting what will be available in the next 5 to 15 years, Peterson notes that Thomas is willing to talk about capabilities such as battlesuit systems architectures and ultralightweight nanorelief networks, self-assembled microtrusses and photopatterned nanocomposites. Perhaps his willingness to share his hypotheses freely is one reason the U.S. Army awarded $50 million to his institute for it to pursue technologies to improve warfighter protection, she posits. Predictions about what nanotechnology will bring in the long term include extremely dramatic changes in applications, Peterson shares. While new uniforms, better armor and improved sensors will be the focus in the midterm, between 15 and 30 years from today attention will be on weaponry, including smart chemical weapons. “These would have all of the power of a chemical weapon in terms of the destructiveness combined with the computation and sensing ability to do a much better job of targeting,” Peterson says. Conventional weapons also will benefit from nanotechnology in the long term. Peterson predicts that future generations will be able to produce conventional weapons, including nuclear weapons, much more rapidly, and this ability poses some issues that must be addressed. “Unless you’re controlling the technology in an arms control sense, you have a situation where countries that look fairly harmless in terms of their capability can very rapidly become a major threat. This is a new world for the military,” she states. Reconfigurable materials also are clearly in the realm of the possible in the mid- and long-term time frame, Peterson maintains. With the help of nanotechnology, these smart materials will change shape much like human muscles when they are flexed. For warfighters, this could mean that a backpack could quickly transform into a weapon, then into a tent, then into a weapon again. And it is these types of military-related capabilities—with all their implications—that concern Peterson. “The main message that I would have for the focus of the military is that we absolutely have got to win this race. This is like nuclear weapons. This is not one we can afford to lose. This is one we absolutely have got to win, and we’ve got to get organized about it,” she says. One effort that aims to bring this about is the National Nanotechnology Initiative (NNI), a U.S. government research and development program whose participants include representatives from 23 federal agencies. In its supplement to the president’s fiscal year 2006 budget released in March, the NNI requested $1.05 billion for its programs. But Peterson contends that the NNI’s design is not conducive to organizing nanotechnology work. “People assume that it’s this coherent organization with a set of goals and they’re achieving those goals, but that’s not what’s going on. It’s a diffused chaotic thing where you have a bunch of professors who have renamed their old work nanotechnology. It’s not bad work, but it does not add up to the kind of capability we need for the productive molecular machine systems that the military is going to need 20 years from now. If I had a message for the Joint Chiefs, it would be don’t count on the current NNI to get you what you need. You either need to reconfigure it or you need to have your own version—one or the other,” she states. Peterson believes that part of the problem is that many of the people receiving NNI funds are natural scientists who are working on their own individual projects. “It’s not a systems engineering project, and you’re not going to get a system that works together out of this disconnected stuff. The fact is that it’s a distributed coalition,” she warns. Smart weapons is one example of where focus is particularly needed, Peterson says. Current chemical weapons can be classified as dumb because targeting systems are still relatively crude. “What you’d want is something that has the destructive chemical action of a chemical weapon, which is really easy to do, combined with sensing and computation, so that when it lands on an object or on a person it can identify that object or person. If it’s a person, [it can] even read their DNA—and then decide whether to implement the weapon or not. I am very serious about this. This is terrifying stuff, and that’s why I jump up and down and say, ‘You folks with a billion dollars a year, we really have to focus on issues. We can’t afford to fritter it away; it’s too much money to waste,’” she says. One of Peterson’s primary concerns is nanotechnology development that is going on outside the United States. In 50 years, nuclear weapons may no longer be the most important issue; however, arms control will be, and the problem is the weapons will be invisible to satellites or to the human eye and will be undetectable chemically. The answer, she submits, is for the United States to stay significantly ahead at all times, and work must begin now because other countries may have certain advantages. In China, for instance, nanotechnology research can be conducted at one-sixth of what it costs in the United States, and the number of engineering graduates exceeds that of the United States. In addition, China is very technologically ambitious, Peterson says, and while the threat is not imminent, the United States could face stiff competition in 20 or 30 years. These challenges give rise to discussions about policy. In the near term, toxicity is a primary concern; chemical nanoparticles already are added to food products. Although the Environmental Protection Agency or the Food and Drug Administration has approved these chemicals for use in larger sizes, studies indicate that they may be toxic at the nano level. “The question is, do we need to redo the system and specify a size range in these applications for approval. And do we need to go back and re-approve these things in the new size range? It’s a huge issue, and it would be very expensive to redo all that work. On the other hand, if it’s got to be done, it’s got to be done,” Peterson states. Policy issues surrounding midterm nanotechnologies involve surveillance and privacy matters. Peterson relates that Americans listed these two topics as their primary concern in a survey about nanotechnology. The Foresight Institute has been lecturing about this topic for nearly 20 years, so Peterson is pleased that citizens truly realize the danger. In the area of policy for nanotechnologies that will be available in 2020 and beyond, Peterson notes that in addition to military issues, economic issues will require policy guidance. “This is the big industrial revolution, and we’ve become very complacent and arrogant in the U.S., assuming that it’s a new technology and we’ll be the leader. That is not true here. Other countries are outspending us deliberately. We are still ahead, but there is no guarantee, especially because our students are not getting Ph.D.s in science and technology and we’re having more trouble importing them from other countries where they do train their kids in science in technology,” she says. To tackle this problem, the United States must ameliorate its recruiting approach to not only attract foreigners to the United States for education but also to make them want to stay after they have earned their degrees, Peterson proposes. Lawrence Gasman agrees that nanotechnologies have far-reaching implications that must be addressed but, based on his observations and experience, is not convinced that the U.S. government is the best choice to lead policy development in this area. Gasman is the principal analyst and one of the founders of NanoMarkets Limited Company, Sterling, Virginia, a firm that analyzes the opportunities and disruptions that advances in technology create. First and foremost, there is a distinction between policy and planning, Gasman says. From a planning standpoint, industry must accept that nanotechnologies are coming—and in some cases coming quickly—and may affect their businesses. They must evaluate the consequences and determine how they want to proceed. In some cases, they may choose to ignore the new technologies; in others, they may decide to change their products and services to capitalize on them. Several companies, including the Intel Corporation, are planning and investing seriously in nanotechnologies, Gasman states. Gasman points out, however, that both the NNI and the Nanotechnology Research and Development Act of 2003 demonstrate that the federal government is making an effort to address nanotechnology issues. “The problem is—and this is where I may differ from Foresight—some of these things are better left alone. For example, I was very involved in the process that led up to the 1996 Telecommunications Act. It took six years within the Senate and the House to come up with an act. That’s not a criticism; that’s what it takes to come up with a plan. There’s a process there, and at the end of it you can say, ‘Bloody politicians—they don’t know what they’re doing. They should be doing something else.’ But as a practical matter, there’s a certain amount of just built-in logic there. That’s the way it works, and it’s hard to change,” he says. Despite maintaining this opinion, Gasman admits that certain areas may call for legislation. However, he believes the possibilities of nanotechnology are so exciting that the legislators should show restraint. “There may be safety and funding issues, and there’s a whole discussion about who should be paying for the research and development. But it’s so easy to overreact,” he states. Gasman does not share Peterson’s concerns about other countries surpassing the United States’ efforts in nanotechnology. Although other countries are investing in the field, he is not aware of any other governments that are devoting as much funding to the discipline. In addition, he is confident that the United States’ unmatched spirit of entrepreneurialism will spur continued technology development. “There is another issue—and I think it’s absolutely different from anything we’ve experienced before—and that’s China and India. Both of those countries are a long way from being entrepreneurial havens, and a country with open ideas is going to be paramount to developing technology in many ways. But it is changing, and it is at least possible to imagine that both of those countries 20 years from now are going to be very significant centers of entrepreneurialism,” he proposes. In terms of the military, Gasman agrees with Peterson that some real issues need to be addressed and that perhaps this is one area where the government should step in. “There’s always this balance of transfer of technology, and it’s a hard balance to strike because there are political issues. We’ve always tried to support our friends in Saudi Arabia, for example, and for very good reasons. On the other hand, it’s very easy to see how what we’ve been sending them can easily fall into the hands of al-Qaida at some point. I don’t know how you strike that balance,” he notes. Although he acknowledges the potential dangers of nano-technology, Gasman offers words of caution. It is important not to exaggerate the threat, he says, pointing out that some people are concerned about weapons of ultimate mass destruction that would be nano-engineered and as big as a matchbox. “At some point you say well that’s a problem for the future, and that might be quite far into the future. I’m told by physicists that eventually the universe will end. I don’t spend a great deal of time worrying about it. You can exaggerate the threat, and I don’t think politicians are likely to do that. But the other issue is the political aspect. You also have to be aware that people use issues like that for their own political gain, and that has to be factored in,” he says.